The Toledo Museum of Art Glass Pavilion is located directly across the street from the Toledo Museum of Art. One of the distinguishing features of the pavilion is that all of the exterior and nearly all interior walls are large panels of curved glass, resulting in a transparent structure that blurs the boundaries between interior and exterior spaces. Juxtaposing gallery space and glass making studios, the Glass Pavilion offers visitors the truly unique opportunity to appreciate the history of glass as an artistic medium, as well as witness its creation, within an architectural marvel of glass. The Glass Pavilion is open during regular Museum hours, and admission is free. Special exhibitions or events may require purchased tickets. Members are admitted free to all exhibitions and receive free admission or discounts for special programs, events, and Museum Store purchases. Toledo was once a major center of glass production; now most of its factories are closed and the glass workers gone. 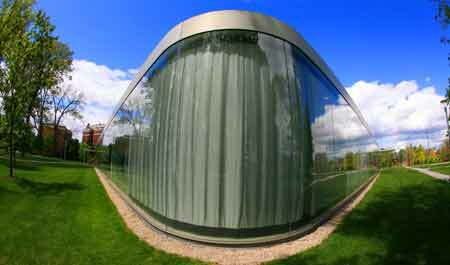 The enormous sheets of glass needed for the pavilion were manufactured in Germany and molded in China. Watch works of art in glass take shape before your eyes—join Museum instructors and local artists for weekly live glass making demonstrations in the Glass Pavilion. These free demos include gallery seating and narration of the process and techniques used. 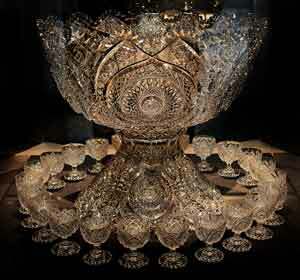 This punch bowl set was produced for the 1904 St. Louis World Fair by the Libbey Glass Company. At the time it was the largest single piece of cut glass in the world, During the manufacturing process, a flaw caused the large bowl to crack during the final stages of cutting and polishing. Already running behind schedule they had to produce a completely new bowl in time for the World's Fair opening which they did. Judges ultimately awarded the Grand Prize Medal for cut glass (a reproduction of that medal is on display in the same case. Tuesday - Wednesday: 10 a.m. - 4 p.m.
Thursday - Friday: 10 a.m. - 9 p.m.
Closed Mondays, Independence Day, Thanksgiving Day and Christmas Day.